On a day Gautam Gambhir took the field as captain of his native Delhi, his rich legacy as captain of Kolkata Knight Riders was felt at every step at the Eden Gardens, as KKR made a sprightly start to the new edition of the Indian Premier League (IPL), edging out Royal Challengers Banglaore (RCB) by four wickets. It also marked a dream captaincy debut in the IPL for Dinesh Karthik, who gave enough indications that he is more than a worthy successor to Gambhir, under whom KKR have become a powerhouse. And talking of the legacy of Gambhir, it was amply on display when Sunil Narine walked out to the centre, at the start of the innings along with the big-hitting Chris Lynn. The experiment of sending Narine to open as a good, old-fashioned pinch-hitter was conceptualised last year under Gambhir, and it immediately paid dividends. The West Indian who was known more as a bowling trump card for KKR, suddenly became an X-factor with the bat, and he often got the team off to flyers, giving the innings a mighty momentum and the rest of the batsmen valuable time to get their eyes in. One may recall Narine going absolutely berserk at Bengaluru's M Chinnaswamy Stadium last year against the same opposition that saw him score what was at that time the IPL's fastest fifty. His record of a half-century in 15 balls was broken by KL Rahul in the first match of the day, but Narine nearly got his record back, notching up a fifty in 17 balls in the end. When Narine was finally bowled by his former KKR teammate Umesh Yadav, he had already put KKR in the box seat. The hosts were already going at over 12 runs per over, needing 177 for victory, and by the end of the powerplay, team had racked up a healthy 68 runs. From thereon, it was only a matter of holding the steering firm, as it were, and Karthik and Nitish Rana did exactly that. A special mention has to be made of Rana, who had really come into the limelight with his performances for Mumbai Indians last year. He had been a pillar of strength for the eventual champions, scoring 333 runs in 13 matches, at an average of just over 30 and a strike rate of 126.13, and the Kolkata franchise had had first-hand experience of the impact Rana could make. Who can forget his stellar 50 off 29 balls for Mumbai Indians at the Wankhede Stadium last year that sunk KKR? Once a power that was used against them, the KKR management ensured that this year, it did their bidding and snapping up Rana for Rs 3.4 crore was a very smart move by the franchise. What the southpaw from Delhi brings to the table is value for money, and he scored a very useful 34 off 25 balls on Sunday too, providing stability to the innings when it needed one. However, it was not just with his batting that Rana impressed on Sunday evening. He was the hero with the ball too – the unlikeliest one, you may add. He came in to bowl in the 15th over, with two of the biggest names of not just RCB, but world cricket on the whole, AB de Villiers and Virat Kohli, going great guns, and threatening to take the game beyond KKR's reach. Rana, who only has a handful of wickets in domestic cricket, and had none before this evening in the IPL, sent back the deadly RCB duo off consecutive deliveries. One would not know if de Villiers and Kohli underestimated Rana's gentle off-breaks and took it a bit easy, as batsmen often tend to do at the sight of part-time bowlers and end up losing their wickets, but there is no denying that it was an inspired bowling change by Karthik. Who knows, like the Narine experiment with the bat, this year one may see the Rana experiment with the ball, and Karthik can cement his legacy much the same way that Gambhir did as the captain of KKR if the gamble of using Rana as a partnership-breaker pays off. As in the case with sending Narine to open, Rana being given the ball is primarily aimed at shocking the opposition and catching them unawares. Karthik's captaincy skills were also showcased by his shrewd bowling changes. 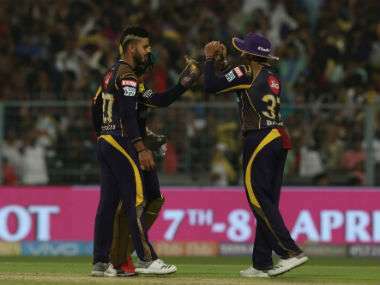 Piyush Chawla was handed the new ball and Karthik juggled between his ace spin trio of Chawla, Kuldeep Yadav and Narine, with lead pacer Mitchell Johnson held back till the eighth over. Karthik realised that Johnson would be needed if the going gets tough as the game progressed, and hence thought better of using up his overs at the start itself, beginning proceedings instead with R Vinay Kumar. As a batsman too, Karthik evoked a lot of confidence. A batsman who smashed a match-winning 29 off eight balls in the Nidahas Trophy final against Bangladesh only the other day, he played a cultured innings of 35* off 29 balls. It was an innings of great character and was precisely the need of the hour. He held one end up, while Rana, and then Andre Russell, were going after the bowling, and when he had to accelerate, Karthik did so effortlessly. Karthik's captaincy skills were also proven by the squad he chose for this game. It was widely believed that KKR had got their strategies wrong in the auctions, ploughing too much of money into buying a few superstars and ending up with little resources to spend on building a team to support those superstars. Thus Chris Lynn, Narine, Russell, Johnson and Mitchell Starc together cost KKR Rs 42 crore, which greatly thinned the resources to spare in order to form a strong support cast. But one must say that there could hardly be a more balanced playing XI than the one used on Sunday. Lynn and Narine at the top made an explosive opening duo, with Robin Uthappa and Rana making up the rest of the top order. Karthik and the hard-hitting Russell made up the middle order on either side of the young and highly talented Rinku Singh, and then there were the bowlers – Vinay Kumar, Chawla, Johnson and Kuldeep. It was a hat-trick of victories for KKR over RCB on Sunday. The last two encounters had turned out to be disastrous for the team from Bangalore – they were shot out for the lowest score ever in the IPL in the first and then ran into a marauding Narine and Lynn in the second, and on Sunday, there was no joy for them too. It was KKR's 12th win over RCB in 21 matches and the sixth win over them at the Eden Gardens. If morning shows the day, KKR promise to go deep into the tournament. RCB, meanwhile, continue to search for a way to reverse their wretched form from last year depite boasting of some of the biggest names in world cricket.